May I ask if Abcam has information regarding the % homology between cynos and humans for CD19? This is border line, but I would still be happy to offer your customer the testing discount as mentioned in the previous email. Please let me know if you would like me to issue the testing discount code for your customer. To issue this I will need the customer's email address. We have a customer who is primarily interested only in staining cells/tissues from non-human primate/cynomolgus monkey with Abcam CD19 antibody (# ab1168). They would like to know its reactivity towards NHP samples. I can confirm that the immunogen used to obtain clone CB19 is a human chronic lymphocytic leukemia cell line. Wetherefore do nothave the specific immunogen sequence used to obtain this clone and to our knowledge it was not further mapped. Could you please let me know which non human primate your customer uses? If the homology of CD19 is 85% or higher and this non human primate has not been tested yet, your customer might be eligible for your testing discount program. For example, the homology of total CD19 with Callithrix jacchus is 88% and therefore it would be worth trying this antibody with these samples. I am sorry I did not have a definite answer for your customer on this occasion and hope this information is nevertheless helpful. 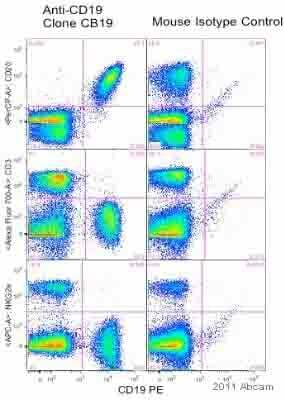 I am looking for an anti-CD19 that would cross reacts with cynomolgus monkey. I noticed that your anti CD19 (ab1168) cross reacts with Chimpanzee, macaque monkey and rhesus monkey. Could you please tell me if it cross reacts as well with cynomolgus monkey? Unfortunately, we don’t have any data to support the cross reactivity of this antibody with Cynomolgus monkey. However, if you are interested in testing ab1168 in Cynomolgus monkey with Flow Cytometry, I will be happy to offer a discount code for a future purchase if you submit the results (in a form of an Abreview) to our website. Therefore, I can offer a discount off a future purchase if you buy ab1168 and test it in Cynomolgus monkey and submit feedback to us in the form of an Abreview. It doesn’t matter whether the Abreview is positive or negative, we would just really like to receive your feedback. The discount would be to the value of 1 free primary antibody. 1. Reply to this e-mail to let me know that you would like to proceed and test ab1168 with Cynomolgus monkey samples. I will then send a discount code. This code must be issued before purchasing the antibody so please wait for my reply before ordering. 3. Test it in Flow Cytometry with Cynomolgus monkey.